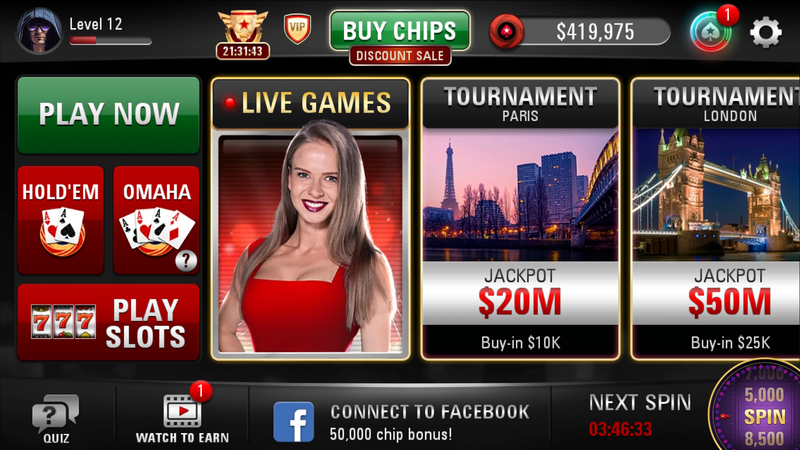 PokerStars Play App: Download and Play with 100,000 Chips! 72% of new players recommend this casino 44 new players chose this casino today! You most probably live under a rock if you’ve never heard of PokerStars, one of the leading giants of the online gambling industry. But… did you know that they also offer PokerStars Play: Free Texas Holdem Poker Game, a poker app for smartphone users? Developed by Stars Mobile Limited, PokerStars Play app offers free games for Android, iPhone, iPod Touch, and iPad users. This is the perfect mobile application if you’re in love with the WSOP (World Series of Poker) tournaments… or are just crazy about poker in general. There is no real-money gambling involved, and that’s why PokerStars Play is legal in the United States of America. The best part? The app is completely free to download! PokerStars Play app offers plenty of possibilities to play poker for free. As soon as you sign up, you get a bonus of 100,000 free chips to start your poker adventure. 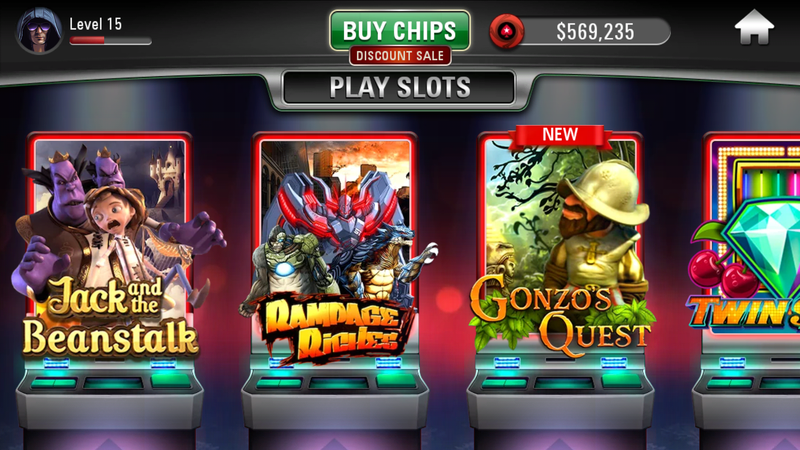 Another great promo is the 50,000 FREE chips bonus. Just connect your PokerStars Play account to Facebook, and you’ll be granted the free bonus. Then, we have the daily free chip bonuses. Every day, you can get up to 100,000 chips just for being a part of the PokerStars Play community. Let’s not forget the Spin the Wheel bonus that takes place every four hours. You simply have to spin the bonus wheel and see how many free chips you got. You can even set a reminder that will inform you when the bonus is available. Spinning the wheel five times in a row unlocks another bonus called the Mega Wheel. Here, you can win up to 9,500,000 free chips. Still not enough? Then, watch a video or complete a poker-related quiz for more bonuses. If you don’t forget to claim all the free stuff, you can play poker at PokerStars Play indefinitely - no need to buy chips if you don’t feel like it. I was pleasantly surprised at how well-made PokerStars Play was. The user-interface is quite intuitive. I had no problems navigating the lobby and browsing through the games of PokerStars Play. I also want to praise the design for a bit. The black background and the colorful images flawlessly complement each other. 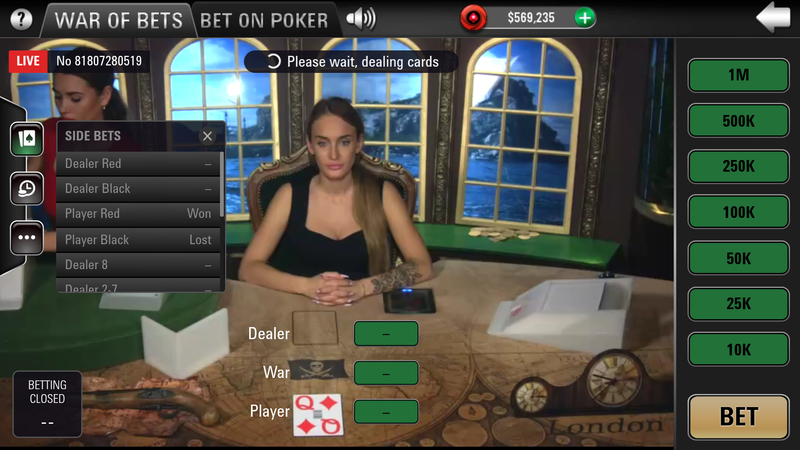 As a result, the poker application is easy on the eyes and has no distractions that would otherwise make gaming difficult. As the app’s name suggests, the majority of games at PokerStars play are comprised of poker. Live poker tournaments online, to be precise. Both of these variations are available in eight modes that have different stakes, buy-ins, and jackpots. The background image of each variation also differs. New York $2.5M$/20M $100M-$2B ? Once you enter the tournament of your choice, you are seated with other players. Even though you play online with real people, you don’t have to wait for any longer than a few seconds before the poker game begins. That has something to do with the fact that PokerStars Play in an insanely popular app in the USA. The community of PokerStars has recently reached 450,000 members. Every moment, there are thousands of people who use the PokerStars app. This is what makes PokerStars Play better than the majority of other American online poker applications. While you compete with other players, you can chat with them. You can either click on a phrase from a list (these are all related to poker!) or type in the message yourself. However, if you don’t want to compete against total strangers, you can simply play with your friends. Just schedule a poker night and invite your Facebook friends to play together. 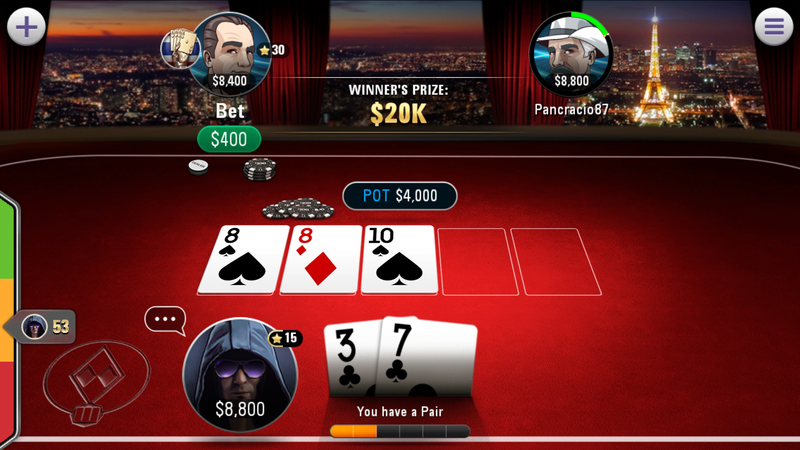 The poker tournaments are not the only thing that the PokerStars application offers to Android and iPhone users in the USA. I’m talking about the card games with a live dealer. I have one more thing to say about the live games of PokerStars Play: the female dealers are truly beautiful! The challenges at PokerStars Play are yet another way to earn some free chips. To see the challenge list, click on the PokerStars logo at the top-right corner of the screen. Each challenge carries a reward of a few thousands of free chips. If you complete all three of them, you unlock a surprise bonus. There are also weekly challenges that are a bit more difficult to complete. Aside from poker tournaments, PokerStars Play offers some quality Slots for American players. Currently, there are 11 different Slot machines available. These include some of the most popular Slots on the internet like Gonzo’s Quest, Jack and the Beanstalk, and Twin Spin. However, Slots are the only casino games at PokerStars Play at the moment. Let’s hope they include some blackjack and roulette games in the future. Overall, I have no major complaints about PokerStars Play. I like the fact that you can really play poker for free without spending a single dollar. However, this is only true if you’re content with low-roller poker tournaments (like me). In case you want to play in Moscow or Las Vegas tournaments, you’ll have to buy chips. Otherwise, it is almost impossible to collect the fee required to join these tournament online. The addition of Slot games is also a nice touch, as it is quite difficult to find good free Slots to play in the USA. In case you encounter any problems, you can contact the customer support of the PokerStars Play app at PokerstarsPlay@pokerstars.net. Your questions will be answered quickly and professionally by a dedicated support team. PokerStars Play is a free poker tournament app by Stars Mobile Limited. It offers poker tournaments, live dealer games, and a few Slot machines. Available for Android and iOS, it is an application for every fan of gambling games.